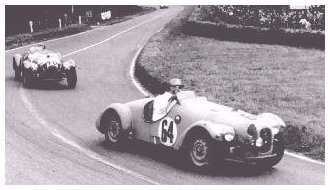 Two type R1 Jupiters at the 1952 Le Mans race: Gatsonides heads a tail-wagging Bert Hadley. Neither finished - it was left to the Jupiter R1 of Marcel Becquart and Gordon Wilkins to take the honours. SCCA National Meet at the Thompson Speedway. 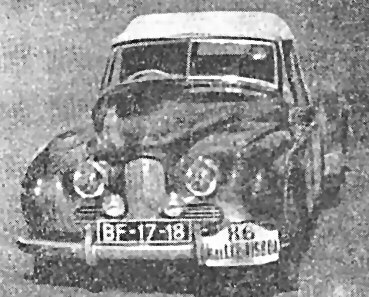 May 1952 a Standard Mk1 Jupiter was the first true production car home in the 1500cc class, at 7th overall. Jupiters tried hard in the International Criterion des Alps 1951, 1952 and 1953. In 1951 Armangaud won his class in the Monza speed test on the first day, and on the third day Wise class-won the Falzarego ascent with Armangaud second. On the fifth day Wise class-won the Stelvio ascent with Armangaud third this time. In 1952 Robinson lost no marks on the first two days before being forced out with brake problems. 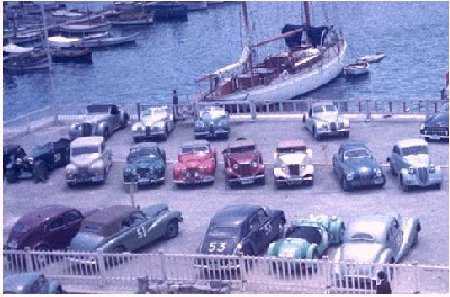 Jowett cars: a Jowett Javelin and two Jowett Jupiters alongside two MGs, in front of friends, at the 1951 start at Marseilles. Recognise the cars that aren't Jowetts, Jaguars, or MGs? Then E-mail me or use the guestbook! August 1952. FCCA National Rally in the Californian high sierras. Outright win by a Standard Mk1 Jupiter.